Construction is one of the primary business sectors in the UK, and covers a wide range of fields including site surveying, design and build, maintenance, repair and civil engineering. Construction is one of the most important sectors in UK business, and is important to, and arguably representative of the larger economy. The construction industry employs millions of people in the UK, and accounts for a sizable chunk of its GDP. It is led by private and public investments, which means that when an economic downturn occurs it's often the construction industry that suffers first. The construction industry doesn't stay down for long though; when economic circumstances improve there will always be a surge in demand for construction projects. In recent years the housing market has been incredibly important for the overall economy, so committing to new housing projects means more work for construction firms. Construction covers the building, maintenance and repair of domestic, industrial, commercial and public buildings. The work is usually carried out my main contractors who specialise in a particular area, such as residential properties or industrial properties. They will take control of particular element of a construction project, or the whole thing, and subcontract work out to heavy construction and speciality trade providers. This describes the design, construction, repair and maintenance of infrastructure, including roads, railways, bridges, tunnels, sewerage and more. Specialty Trade describes contractors who specialise in a particular trade, which could typically include electrical, building, plumping, roofing or carpentry. Speciality trade contractors generally don't take responsibility for entire projects, but tend to be subcontracted by general contractors, architects, building managers and property owners for specific tasks. There are several different players in construction projects. Clients initiate projects and decide what is going to be constructed. They can range from commercial or residential property developers, retail managers, road and railway agencies, utility companies, local authorities, state authorities and individuals. Designers play a key role in creating the designs which will turn into reality. Designers can be made up of civil engineers or architects. Contractors are the ones who carry out the work for any build, repair or maintenance project. Working in the construction industry is usually fairly physically-demanding, with workers expected to embark on challenging projects requiring stamina and physical strength. This standardly includes working in cramped, awkward positions, standing, bending and kneeling for long period of time potentially, as well as lifting and carrying heavy items, working in unfavorable temperatures and being exposed to the weather for long periods of time. Working in construction is safer today than it has ever been, but workers still encounter high risk situations including working with dangerous materials, working at height, and working in cluttered, crowded building sites with said dangerous materials and equipment. Construction workers are more prone to accidents and injuries than most other jobs, and will often not receive sick pay for time off due to illness or injury as they are subcontractors rather than full time employees. Construction workers typically work full-time, up to 40 hours per week or as a project requires. In general construction workers do not work weekends, evenings and public holidays, although if a project is running late and needs to be finished then additional time may be requested, and sometimes this will not be treated as overtime. Adverse weather conditions can put a stop to some construction works, which means that construction workers often need to get used to getting unscheduled days off for which they may not be paid. Remuneration in the construction industry varies greatly depending on a particular individual's level of qualification, skill, position, location and more. Those with skilled trades such as plumbers, electricians, masons etc. earn more than unskilled tradespeople, while those in managerial roles and technical trades can earn substantially more. Alan Cairns writes on a number of subjects including recruitment and health and safety. 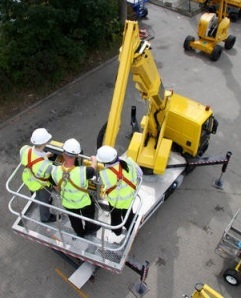 Universal Platforms provide cherry pickers and access platforms for construction teams to work at height.